Feeling itchy is not fun. Firstly, you have a low quality of sleep and we all know how a sleep debt effects your mood. Behavioural change with the itchy dog is common. Where did the itches come from? Itchiness has a protective role to alert the body to potential danger. However, in the allergic dog this protective mechanism works in overdrive. An itchy reaction can be triggered by many different triggers (e.g. pollen, flea saliva, foods, ants). The itches can also be a sign of other internal disease such as an impaired immune system. Furthermore, in the anxious dog chronic stress is thought to impair the immune system. This is why the itchy dog is often also the anxious dog. Solutions for the itchy dog depend on the cause. Traditionally prednisolone (synthetic hormone) was used. However, this medication causes irritability and other behavioural deterioration. Fortunately, there are now some terrific alternatives. A new generation of treatments for the itchy dog has arrived. Cytpoint is an injectable medication that begins working within 1 day and delivers 4 to 8 weeks of relief for the itchy dog, allowing damaged skin time to heal. Apoquel is the tablet version and is also available to dogs in Australia. 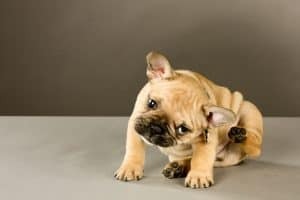 The best part is your itchy dog can be itch free without the side effects of past treatments. If your dog has allergies ask your vet for a referral to one of our local skin experts, a veterinary dermatologist. Uniquely skilled at solving the itches, there is an expert near you.